We have 2 more events before the end of the year so hope to see you – at least once!! This month’s evening event is our annual social. There’s no speaker, no specific topic – it’s just all about chatting, catching up, talking product management (or not) and getting to know each other better. It’s also Product Anonymous’s 2nd birthday!!!! The IDEO +Acumen+ HCD course is a do-it-yourself group course which in 6 weeks runs you through the entire IDEO design process for Human Centred Design. The course is sponsored in Australia by +Acumen, which is an organisation that helps people self-learn. We had a big crowd for this session, and when circling the table to see what attracted people we had about a third who had done the course and were interested in unpacking it with others who had done the course and a third who had experience in human centred design and the last third interested in understanding the value of doing the course themselves. It was a good mix of people to encourage good discussion throughout the presentation. 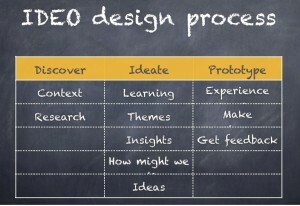 IDEO’s design process covers three areas: Discover, Ideate and Prototype. Within each of these areas there are levels which are quite important breakdowns of the process. By understanding these smaller elements, you begin to get an appreciation for a robust and repeatable process, which still has the flexibility and room for customisation to be applied to any project. 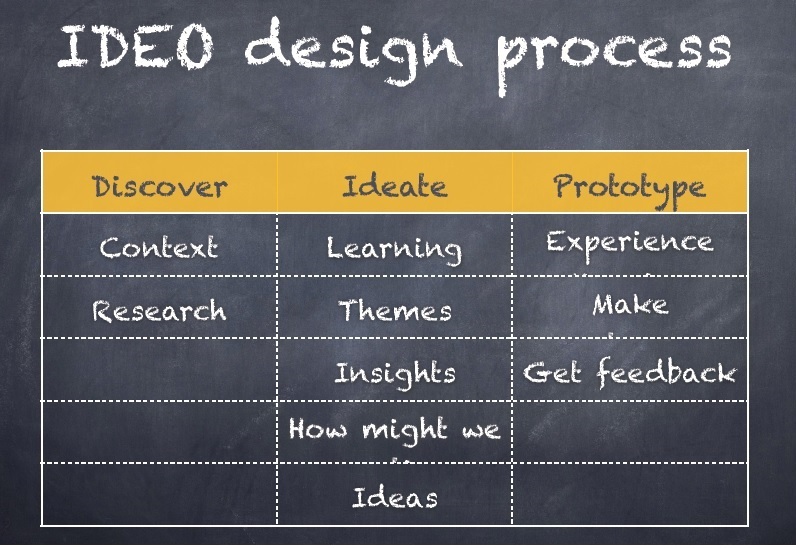 The Discover phase can iterate between research and context for a time until you are comfortable you know what you are pursuing before moving onto the Ideate stage. Within Ideate, you can progress along – whilst repeatedly revising your direction – until the point where you consider heading towards Prototyping. As we were on a course, we followed a VERY linear path, but those who had experience with this approach called out that you might stay in an area of focus for a long period until it was right or you might be very structured but repeat from start to finish each week. It depends on the project, the team and the overall goals you may have when applying this approach. It was a great part of the discovery to understand the more discreet steps within each area and learn ones strengths and weaknesses at each. For example getting out there and just asking people questions was hard to get going, but once you started and found that people are amazingly open and willing to share their thoughts it got easier. One of the complaints regarding the course was that it took far more time than indicated. One of the group at the session didn’t complete it as they struggled to keep momentum going after 6 or 7 weeks and not being in sight of finishing. The group I was with came very close to giving up, but we managed to rally to get to the finish line. We also made a conscious decision to skip some elements in order to see out the course to the end. Once my group got to the brainstorming stage we as a group had one of our best grok moments of the course. We found that it wasn’t so hard to generate ideas, by having everyone think out loud so we could build off each other – the faster we shared “conventional” ideas the quicker we got to better ideas. Once we were done it was quite easy to spot the good stuff. With only the option to score on achievable and innovative and one vote per person per criteria the “winners” bubbled up quickly. 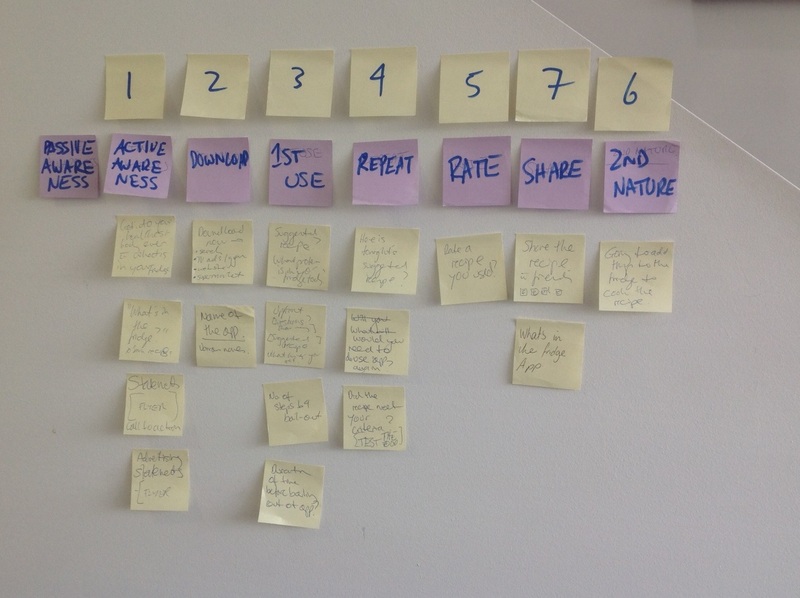 This methodology for group focus on progressing ideas to prototyping was fabulous. The last stage was Prototyping and I must admit I thought we would immediately start to build and kind of get creative right away. I was impressed with this stage having a scientific approach that ensured you tested an idea rather than the whole product. 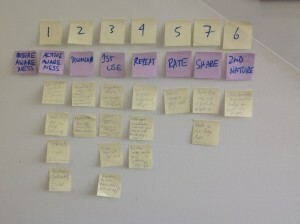 The user experience map was a great way to break it up into small achievable steps, whilst at the same time understanding your goals and vision for an end state product or service. This was the moment this course struck gold for me for as a product manager. I think these elements are used commonly in product management (testing, revising, build at “story” level) but the insight here was that you need to test a step in the user experience before committing to the whole product. The other insight was that prototyping does not need to be such an expensive fully designed product, but something light (easy to throw away!) such as a story, a diagram or an ad. These options allow for prototyping without development and can be really useful at many stages of the product management lifecycle. As Steve highlighted, even before you have a team, and before you have money, and when you need to make the case for the business case this no cost prototyping brings the validation to get your next idea across the line. Some additional thoughts are called out in the deck below. Please feel free to add your comments or questions below if you have done the course or have your own experiences with this methodology. For those who don’t know, I’ve been overseas the last few months – mostly in Shanghai. Being in a new city with such a different culture to my own (even my adopted cultures), I found I was constantly asking ‘why’ on a very regular basis. I was taking mandarin classes learning how to ask ‘what’ and ‘where’ but what I really wanted was to ask ‘why’. I kept seeing all sorts of scenarios where I wanted to ask ‘why’! For example, why do some foods need to be wrapped in layer upon layer of plastic wrap when meat was available for sale unrefridgerated on a cardboard table? Although even after I learned the word for ‘why’ – wèishéme – I knew I wouldn’t be able to understand the answers (my mandarin has improved but it’s very much a work in progress!). I became a little obsessed with wèishéme and it got me thinking about asking the question in product management. Whether we’re talking with a customer or end user, determining which feature to build next or how to market our product, understanding the ‘why’ is needed to help us connect, make our products great and create success. Understanding ‘why’ uncovers the value and explains why we care, what the context is, influences us and focuses on the problem (not the solution). We can integrate ‘why’ into our existing tools like positioning statements, interviews & research, and even agile stories. I’d also recommend The Power of Habit: Why We Do What We Do in Life and Business . It didn’t make it into the deck but is an excellent read.